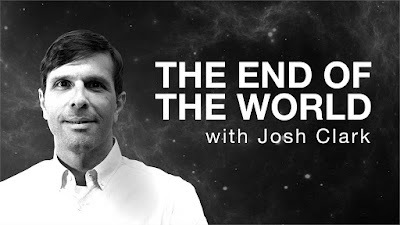 The End of the World, in collaboration with HowStuffWorks, will be available for download on November 7. The new podcast is hosted by Josh Clark, co-host of the award-winning podcast Stuff You Should Know, and presented by iHeartMedia. On the new show, Clark will discuss the existential risks humankind faces and assess how they may be coming in the form of the technology we’re beginning to develop today. Clark will be joined by a number of experts across the podcast’s ten episodes, from astrobiologists to philosophers to economists and transhumanists. Fans can hear the official trailer now. The first three episodes of "The End of the World with Josh Clark" debut on November 7 and subsequent episodes will air weekly each Wednesday and Friday, available on Audible, iTunes, Spotify and more. Clark’s compelling and insatiable curiosity will guide listeners through a dark debate around the astoundingly odd and unique nature of human intelligence and how that might either destroy or save the species. The podcast will discuss pending threats to human life and the importance of mastering emerging technology – like high-energy physics, risky biotech experiments, and nanotechnology – in order to secure a future for humanity that could last for billions of years. To access the first few episodes, please click here.